Beicip-Franlab provides widely recognized expertise in fractured reservoirs management. Our methodology is based on the multidisciplinary integration of various data types and use of advanced IFP group software such as FracaFlow and PumaFlow. This technology is supported by 20 years of worldwide experience with fractured reservoirs, and helps us with the effective characterization, modeling and simulation of naturally fractured reservoirs. BFrac is android based application for collecting and indexing fracture data during the core description by adopting the Beicip-Franlab methodology. It has been designed in order to replace the data collecting on paper. BFrac allows us collecting the structural features data such as stylolites, cracks and detailed information about natural fractures: presence of cement, fracture type, length, aperture, inclination, tips and additional attributes. In addition, it allows monitoring the fracture distribution during the core description with a real time statistics table. A camera functionality was implemented to take pictures directly linked to a specific depth-interval in order to have an indexed core photo-report for our clients. It represents an innovative tool that is used exclusively by our team of structural geologists for the characterization and modeling of fractured reservoir. About half of the world’s oil and gas reserves are trapped in naturally fractured reservoirs. The interest in their exploitation has only significantly increased in the last 25 years, when improvements in drilling technologies allowed increasing recovery factors and more cost-efficient development. Today, naturally fractured reservoirs are important targets for several E&P actors, from mid-sized operators to global scale IOC and NOC. Despite of their economic interest, a large number of naturally fractured fields remain untapped due to their challenging development. Irregular fracture distribution, fluid flow anisotropies, and complex fracture modeling, simulation and forecasts are just few of the main difficulties faced by O&G companies dealing with fractured reservoirs. Thanks to our thorough experience gained in different geological contexts worldwide, and using the most advanced tools and methodologies available on the market, we are able to provide a highly qualified consultancy giving the client a full understanding of the problem and enabling subsequent conscious decision making. The main goal of this task is to gain a full understanding of the fracture network geological characteristics and their related dynamic behavior. This result can be achieved by integrating all the types of data available such as core and outcrop descriptions, borehole image logs, structural interpretation, scientific literature, geomechanical models, seismic data and dynamic data. After detailed data QC, analysis and interpretation, we are able to provide our understanding of the studied fracture network, and how it impacts the fluid flow. Using our in-house fractured reservoir characterization and modeling software FracaFlow we deliver a Discrete Fracture Network (DFN) model of the reservoir that integrates the understanding and the results acquired from data analysis. The model is calibrated to both static and dynamic data to ensure reliability and improve the history match. The DFN model provides equivalent fracture parameters, which can be used in both single and dual porosity models. 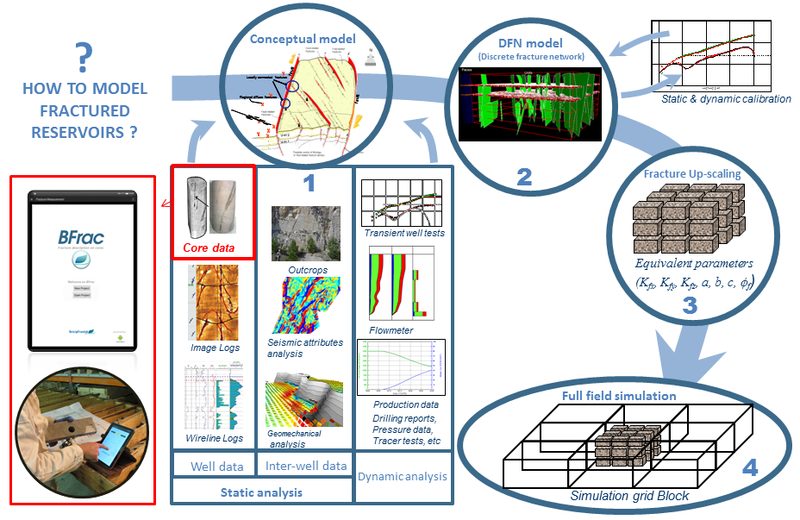 A good knowledge of the complex flow mechanisms that occur in a fracture reservoir, together with the capacity to adequately simulate them, enables us to provide our clients with accurate simulation models using PumaFlow (IFP group reservoir simulator) and optimal field management plans. 60 fractured fields studied worldwide including 10 of the world’s 50 largest oil fields.